Daily Backup (Clone and Safe Update features included) Free for GoDaddy hosted websites, or $2/mo per website not hosted by GoDaddy. Uptime Monitor Free for GoDaddy hosted websites, or $1/mo per website not hosted by GoDaddy. Click Add-ons in the left sidebar. All websites are listed on Add-ons screen. 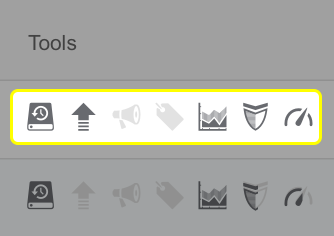 Right next to the Status & URL column is the Tools column. Click the add-on that you need to activate.